Lillys Love Has The Only "HAPPY STUFFIE PARTY HAMMOCK" These not only the happiest place for your stuffies to live, they are well made, easy to install and last so you wont have to get another one. Product Includes: Two Toy Net Hammocks, instructions with pictures, and hardware. Sorry currently does not include toys. Lillys Love GUARANTEES all of their products. If you do not totally love your product for any reason simply contact Lillys Love for a replacement or refund. 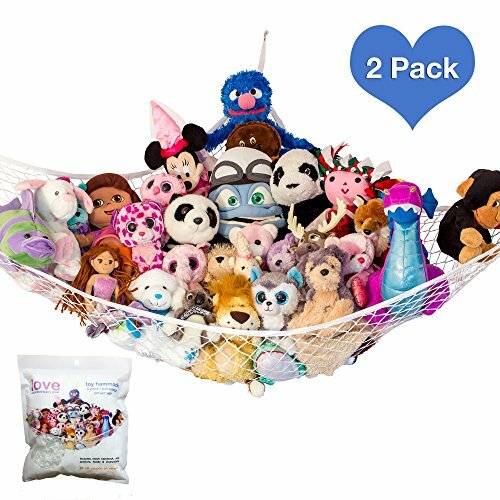 Get your Lillys Love "Stuffie Party Hammock" ADD TO CART now to enjoy a organized toy room, and happier stuffies in a few days. YEAH!! NEW DESIGN LAUNCHED SPRING 2018 - EASY TO INSTALL, REAL NETTING DOES NOT RIP OR SNAG Great Solutions for baby storage. Keep the stuffed animals, baby toys, jumbo toys stuffed pet toys, and stuffed animals out of the way, and tidy. 3% is Donated to the Buddy Bench program. STUFFED ANIMAL HAMMOCK NETTING TO GET THE STUFFED ANIMALS SITUATION UNDER CONTROL? - Get the 2 Pack, they are easy to install toy nets canopy today and take back the bedroom floor. WITH CONFIDENCE from a known trusted company. LILLYS LOVE has hundreds of customer reviews & feedback - 3% is donated to the community through the Buddy Bench program, we offer a Lifetime Quality Guarantee with a "no questions asked" return policy. HARDWARE INCLUDED for INSTALLATION - easy to install toy storage organizer, uninstall, and reinstall. Includes 3 hooks with anchors, understandable directions given both in words and pictures. Spans 60"x 52" x 52"
NEED TO GET THE NETS FOR STUFFED ANIMALS SITUATION UNDER CONTROL? - Easy kids room storage to install toy nets take back the bedroom floor. If you have any questions about this product by Lillys Love, contact us by completing and submitting the form below. If you are looking for a specif part number, please include it with your message.